The LFTs blood test checks the LFT blood levels. LFT testing is done to assess hepatic function. What is an LFTs test? The LFTs test measures LFT blood levels. Why is the LFTs test important? The LFTs blood test, or hepatic function panel, is a standard screening test for liver function. This LFTs Blood Test is a blood test. The LFTs blood test panel, sometimes known as a hepatic function panel, LFTs blood test, LFTs test, or LFTs lab test, measures the LFT blood levels. This LFTs blood test panel consists of a widely used panel of lab tests meant to screen liver health. Specifically, the LFT lab test includes the albumin test, alkaline phosphatase test, ALT test, AST test, direct bilirubin test, globulin test, indirect bilirubin test, total bilirubin test, and the total protein test. The liver is an important organ located in the right upper part of the abdomen. The liver performs a number of vital functions, including producing a variety of proteins and chemicals, breaking down red blood cells, detoxifying the body and participating in the regulation of blood glucose levels. The components of this LFT test panel help to assess the health and performance of the liver. This LFT blood test panel measures blood levels of ALT and AST, albumin, alkaline phosphatase, bilirubin (direct, indirect and total), globulin and total protein. Not only do levels of these markers provide information independently as to the state of the liver, but calculations can be made using the independent markers to gain additional insight into the liver's health. Broadly speaking, ALT (alanine transaminase) and AST (aspartate transaminase) can be categorized together as liver enzymes that, when elevated, indicate damage to the liver itself. Used together, an AST / ALT ratio is sometimes calculated to help identify potential sources of liver damage when abnormalities are present. An AST / ALT ratio >2 is suggestive of liver damage related to long-term, excessive alcohol use although it is infrequently related to muscle conditions or specific genetic disorders. Relative elevations in the ALT levels might suggest liver disease related to other conditions. Bilirubin levels provide insight into how the liver is breaking down red blood cells (RBCs) - another one of its important functions. The total bilirubin level is the sum of the direct, or conjugated, and indirect, or unconjugated, bilirubin levels. Unconjugated bilirubin is made when the RBCs are broken down in the liver and it then undergoes a metabolic process that changes it structurally to conjugated bilirubin. Conjugated, or direct, bilirubin is then excreted from the liver into the bile ducts. If the liver is having problems conjugating bilirubin, then indirect bilirubin levels will be high while direct bilirubin levels will be normal. If the liver is having problems excreting bilirubin (e.g. obstructed bile duct from gallstones), then both indirect and direct bilirubin levels will be elevated. As a result, bilirubin levels can be instrumental in determining how the liver is functioning and if there are any anatomical obstructions preventing it from finishing its job. Alkaline phosphatase, or ALP, is an enzyme found in the bile ducts and also in bones and the placenta when present. In terms of liver health, alk phos levels rise when there is a problem with the bile ducts such as a blockage or inflammation from any of a number of causes. Because alkaline phosphatase can also be elevated because of bone problems, high alk phos blood levels should be used in conjunction with other liver blood markers to understand if the problem has to do with the liver's health or something else. Albumin, globulin and total protein are markers of general nutritional health. When the liver is chronically under stress or damage, it reduces the creation of these markers which can be detected in blood levels. Extreme examples of this can be seen in states of starvation. Given that the LFT blood test panel only requires standard lab equipment, getting an LFT lab test near you typically involves just finding a convenient lab location and getting tested. 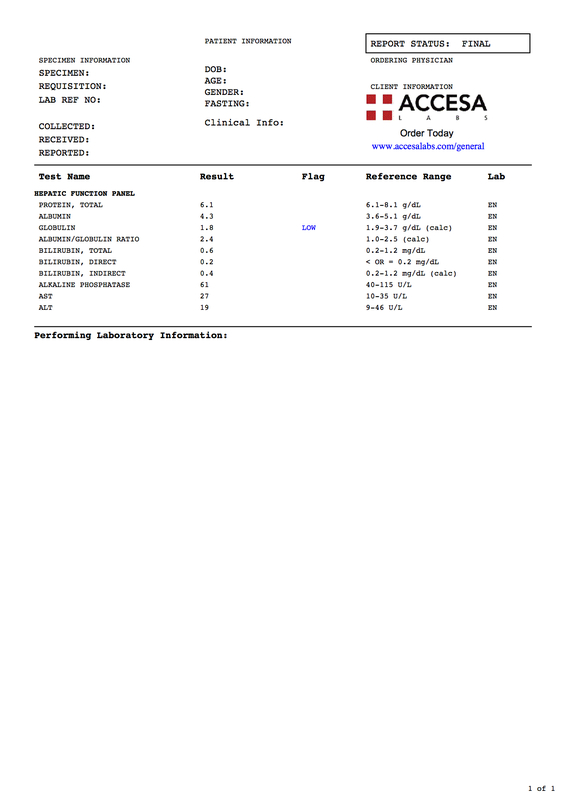 Once your blood is drawn, your LFT blood test report will appear similar to our sample report provided above. On your report, your LFT blood test levels will be reported under the Result column and you can compare them to the reference range for normal provided by the lab. If your specific LFT test result falls outside of the normal range, your test result will be flagged to help you focus on any abnormalities. This LFTs blood test is a component of the more comprehensive liver health panel. LFTs Blood Test at Guaranteed Prices.